USGS map of wells sampled for arsenic with color coding to represent the % of samples that failed standards. We simply can’t sugarcoat it. 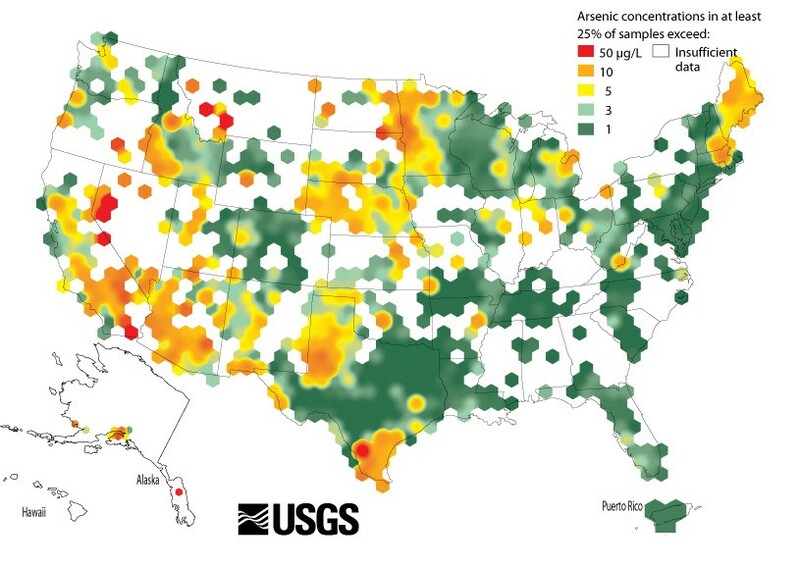 It’s the secret that no one likes to talk about, but Northern Nevada has the highest arsenic levels in the continental U.S. (The EPA limit is 10 parts per billion (ppb). Our private wells average 56 ppb -doubling second place Montana at 25 ppb.) . There is no “safe” level for arsenic, only “acceptable”. “Arsenic is a dangerous neurotoxin & it’s also bio-accumulative, meaning once it’s in your system, it stays there. In our 26 years of helping locals remove arsenic from their water, we’ve come across scores of people who’ve lost a loved one’s , had bladder cancer , leukemia, skin lesions, digestive problems, lost a pet or felt lethargic only to find out they had high levels of arsenic in their blood . Over 50% of the private wells in Northern Nevada exceed the EPA limit for arsenic, and most homeowners don’t even know they should test for it. Our area of Northern Nevada is well above the legal limit. City Water Has Arsenic Too: Think only well water is contaminated with arsenic? Think again. We’ve tested water from several sources detected between 3 and 7 ppb arsenic. The local water authority draws water from over 100 wells and it’s often “blended” with our river water to dilute the arsenic levels until they reach the EPA limit. According to the TMWA consumer confidence report, the arsenic in city water spiked at 14 ppb in 2016 and 13.6 ppb in 2017. This isn’t technically a violation because the EPA uses a weighted average, but the end user has no way of knowing when it’s a 14 ppb day and is drinking water that fails Safe Drinking Water Act standards. Actual chlorine test of city water at our warehouse. 2) CHLORINE AND CHLORINE DISINFECTION BYPRODUCTS. Adding chlorine to city water is necessary to kill bacteria and prevent contamination. City water in downtown Reno (where our office is located) often has a residual chlorine level of 3 parts per million (ppm). That level is higher than the recommended limit for public swimming pools. Highly chlorinated water causes alarming levels of Trihalomethanes (THMs) at 75 ppb (EPA limit 80 ppb) and Haloacetic acids (HAAs) at 41 PPB (EPA limit 60ppb) in our local water supply. THMs and HAAs have been found to cause reproductive issues, cancers, skin damage, and even birth defects. Chlorine & Gut Bacteria: Chlorinated water will kill many of the good bacteria and microbes that live in our stomach and intestines. Chlorine & Marijuana cultivation several local cannabis cultivation facilities have recently purchased large filtration systems from us because the high Trihalomethanes levels were killing their plants. Unless you’re getting your water straight from the Truckee River 100% of the time, you will most likely have hard water that accumulates over time, & slowly leaves a coating on everything it comes in contact with. Shower doors, granite countertops, faucets, sinks, dishwashers, towels, dishes, cutlery and glassware will all need to be replaced… You don’t notice it until it’s too late and time to remodel. This buildup is more than annoying. The efficiency lost in your water heater and other appliances costs you big $$$ every single month. Our biggest source of new business comes from homeowners who are remodeling and don’t want the water to ruin their home again. Don’t let hard water hurt destroy your home! Green hair from chlorine damage. Have you noticed that when you first dye your hair, it looks shiny and vibrant, but after bathing the sheen and color fades quickly? This is due to the harmful effects of hard water and chlorine! Nevada is already a dry climate. Add to it the “swimming pool” effect of chlorinated water and your skin dries up like the black rock desert. We often install Dechlorination systems for people who have colored their hair only to have the color fade rapidly or even change color. If your blonde hair is turning to a green tinge, it’s the chlorine in your water! Many people spend hundreds of dollars for shiny hair and soft skin; doesn’t it make sense to clean them with healthy water? Most recently, we encountered a family that had moved to the area a few months prior. Their child had developed severe eczema and they were up to a whopping $1,700 per month in medicated lotions and prescription ointments. After installing a system their child’s skin cleared up within a couple weeks relieving major discomfort for the child and saving the parents thousands of dollars. Don’t take our word for it though, check out our reviews from customers who have stated what a difference treated water has made on their skin and hair. The local water authority says it has enough water pipes in northern Nevada to span a line “all the way to Las Vegas”. A lot can go wrong! It doesn’t matter how clean the water is when it leave the plant as it’s constantly coming in contact with chemicals & deteriorating water pipes made of many compounds. 50 years ago, the local water authority used asbestos-laden water pipes to deliver water to our homes and those pipes are still being used today. The new plastic pipes used in 2005 for new construction failed because the chlorine levels were so high that the new pipes became brittle and began to leak! Metal pipes will Rust. When the underground pipes leak, soil is introduced into the delivery system. Bottled Water is Not the Answer! With bottled water come bisphenol, micro plastics and many other chemicals that activate when the bottles get hot in your car or delivery truck. Then there is the waste issue & you can’t shower in bottled water. Locally-owned Pure Water Systems of NV has installed over 12,000 water systems in Northern Nevada since 1993. We have in stock over 25 different systems to combat your specific water issues. We offer the best water filtration equipment on the planet with guaranteed results.